Starting point/parking The hike starts close to the side of road 550, about 4.6 km north of the quay at Herand. Pass the municipality border between Jondal and Ullensvang by about 250 m to the north. Look for the hiking sign for Samlen on the left hand side (west). It’s possible to park off the side of the road here, or otherwise back at the highest point of road 550 (Åsleitet). Parking at own risk. The information board relevant to this tour is at the beginning of the forest road to Våhaug, 500 m south of the starting point. Description of the hike The hike starts on a short forest track. After about 100 m you can find the sign marking the path taking you left through a spruce forest. Continue up a steep scree incline until you reach a rock wall. Steps have been built to assist you pass this point. The path moves left, through a pass, «Fureskora» and then to the right, up a fairly steep incline. After passing the tree line you’re able to get a magnificent view of the mountains and the village of Herand. The path crosses a short marshy area and then continues steeply uphill until you reach the top. 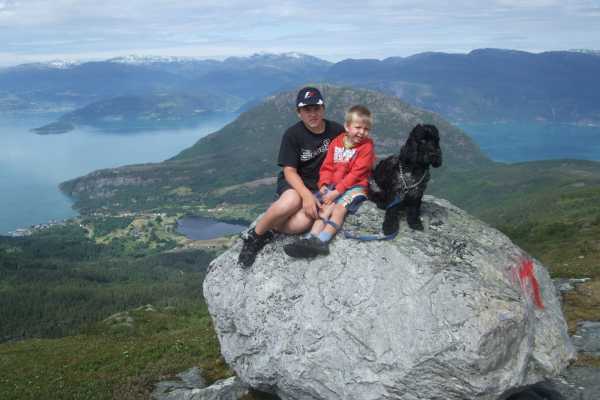 Enjoy the spectacular views of the Hardangerfjord! Season May – October/November. Do not attempt this hike if there is snow, ice or frost. Hiking advice Bring food, drinking water and windproof clothing. We advise you to use hiking boots. If it’s been dry for a while you could use trainers/sneakers. We recommend that you bring a map of the area and a compass, or a GPS. Good cell phone signals covering most of the hike. Dogs must be kept (by law) on a leash at all times between April 1 and August 20. Open fire is prohibited in the hills and woods between April 15 and September 15. You are free to walk anywhere in the hills and mountains. Take care of the nature and show special consideration to all wildlife. Please do not litter. Starting point/parking Parking close to road 550, approx. 200 meters north of the quay/wharf in Herand. Sign posting is good. Parking at own risk. Description of hike Walk over the bridge and follow gravel road to the left as long as it goes. You will pass a farm yard before you enter a marked path. Continue the walk through easy woodland. The landscape is unique due to bio diversity, archaeological findings, geological phenomena and culture. There are several information boards along the path with tables and benches at viewpoints. Season This hike is avaliable all year around as long as the path is not covered with snow or ice. Trip advices: - Bring food and drink and enjoy this beautiful and short hike. - Dogs need to be on leash between 1st of April until 20th of August. - No bonfire from 15 th of April until 15 th of September. - Do not litter! Skildring av tur Ved parkeringsplassen er det ei infotavle. Gå ca. 50 m til ei bru. Her er det skilta til Vatnasetenuten og Tostøl. Denne turen er ein rundtur og er omtalt å gå først i retning Tostøl, men vanskegraden er svært lik om du vel å gå motsett veg. Gå over brua i retning Tostøl. Stien er forholdsvis lett å gå, men med ein del små kneiker. På blaute parti er det er lagt steinar til å trø på. Etter ca.1 time kjem du øvst i Saurdalen, til eit stikryss med skilting til Vatnasetenuten og Tostøl. Gå mot Vatnasetenuten. Etter nokre kneiker kjem du opp på eit høgdedrag og har god utsikt i alle retningar. Følg dette høgdedraget mot nord heilt opp til Vatnasetenuten. Flott utsikt frå toppen. Turen vidare ned til Våhaug er bratt i starten, men elles er det lett å gå. Sesong Mai - oktober/november. Du kan også gå turen på ski om vinteren, men då vert turen noko meir krevjande og lengre fordi skogsbilvegen ikkje er brøytt, og du må derfor gå frå hovudvegen. Råd for turen -Ta med mat, drikke og vindtette klede. - Du bør ha fjellstøvlar, men har det vore tørt ei stund kan du også bruke joggesko. - Mobildekning er ikkje god på heile turen. Vi anbefaler kart og kompass, ev. GPS. - Det er bandtvang 1. april – 20. august. - Det er forbode med open eld i skog og mark 15. april - 15. september. - Til fots kan du ferdast fritt i utmark, men ver varsam og ta omsyn til dyr og fuglar, og til naturen elles. Ikkje kast søppel. - Turistinformasjonen kan gi opplysningar om fiske og kjøp av fiskekort. Kart Startpunkt/parkering 4,1 km nord for Herand kai tek du av mot aust frå veg 550, på ein skogsbilveg litt sør for det høgste punktet på vegen (Åsleitet). Det står ei infotavle der. Etter ca. 100 m må du betale avgift for å køyre denne vegen med bil (kontant betaling). Ved enden av vegen er det god parkeringsplass (Våhaug). Parkering på eige ansvar. Skildring av tur (2-3 timar, rundtur) Turen går for det meste i tørr og god sti; i starten gjennom bjørkeskog, og når du kjem over tregrensa går stien oppå ein rygg heilt til du kjem opp til Såtesteinane. 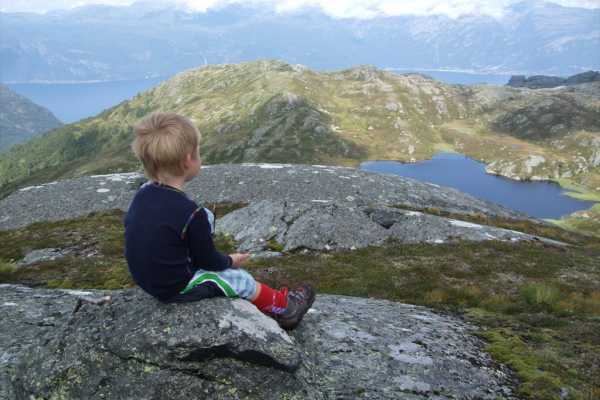 Fin utsikt mot Hardangerfjorden, Samlen og ned til Herand langs heile denne ryggen. Ved Såtesteinane vender stien mot Såta, med utsikt mot stølane og tilhøyrande vatn for tur nr. 6. Flott utsikt i alle retningar når du kjem opp på Såta. Vidare går du ned til krysset med stien til Tostøl, og følgjer denne stien tilbake til Våhaug og vidare ned vegen til Langaskarv . Denne turen er ein rundtur og er omtalt å starta ved Langaskarv, men vanskegraden er svært lik om du vel å gå motsett veg. Då går du opp til Våhaug og vidare mot Tostøl. Når du kjem oppover eit stykke er det skilta til Såta. Sesong Mai - oktober/november. Du kan også gå turen på ski om vinteren, men då vert turen noko meir krevjande og lengre fordi skogsbilvegen ikkje er brøytt, og du må derfor gå frå hovudvegen. Råd for turen -Ta med mat, drikke og vindtette klede. - Du kan ofte gå denne turen i joggesko. - Mobildekning det meste av turen. - Vi anbefaler kart og kompass, ev. GPS. - Det er bandtvang 1. april – 20. august. - Det er forbode med open eld i skog og mark 15. april - 15. september. - Til fots kan du ferdast fritt i utmark, men ver varsam og ta omsyn til dyr og fuglar, og til naturen elles. Ikkje kast søppel. - Turistinformasjonen kan gi opplysningar om fiske og kjøp av fiskekort. Gradering Kart Startpunkt/parkering 4,1 km nord for Herand kai tek du av mot aust frå veg 550, på ein skogsbilveg litt sør for det høgste punktet på vegen (Åsleitet). Det står ei infotavle der. Etter ca. 100 m må du betale avgift for å køyre denne vegen med bil (kontant betaling). Etter ca. 2,1 km (ca. 300 m før enden av vegen) kjem du til Langaskarv, der det er skilta til Såta. Her er det ein liten parkeringsplass. Parkering på eige ansvar. Ved enden av vegen er det ei infotavle. Description of the hike There is an information board at the car park. Proceed to the bridge and find the signs marking the routes to Vatnasetenuten and Tostøl. Follow the trail to Tostøl. The path is fairly easy with a few short inclines. Stepping stones have been laid out in the muddy parts. Shortly you meet a branch in the trail with markers for Tostøl and Såta. Follow the trail to Tostøl. 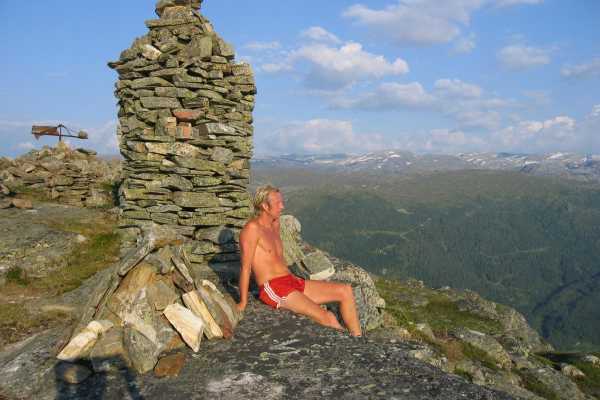 After about 1 hour you reach the top of Saurdalen and meet a branch in the trail. Here you find markers for Vatnasetenuten and Tostøl. Take the path to Tostøl. Shortly you arrive down at the mountain cabins at Samdalsstølen with the lake Viddalsvatnet below. Tostøl is about half an hour further on. Season May – October/November. You can also use this tour as a ski hike in the winter. However it will then be longer and more demanding because the forest road is not maintained during the winter. The hike will then have to start at the main road. Hiking advice Bring food, drinking water and windproof clothing. We advise you to use hiking boots. If it’s been dry for a while you could use trainers/sneakers. We recommend that you bring a map of the area and a compass, or a GPS. Cell phone signals are NOT GOOD during the whole of this hike. Dogs must be kept (by law) on a leash at all times between April 1 and August 20. Open fire is prohibited in the hills and woods between April 15 and September 15. You are free to walk anywhere in the hills and mountains. Take care of the nature and show special consideration to all wildlife. Please do not litter. Ask the Tourist Information («Juklafjord») regarding angling/fishing and the purchase of fishing permits. Hiking level Map Starting point/parking Take road 550 to the north from Herand quay. After 4.1 km, and slightly south of the highest point in the road (Åsleitet) you leave the main road (eastwards) and follow onto a forest road. You will find an information board there. If you continue by car this is a toll road. The pay point (cash only) is 100 m in from the main road. There is a good car park at the end of the road (Våhaug). Parking at own risk. Description of the hike (3 Hours, Loop) There is an information board at the car park and a sign marking the route towards Fodnastøl. The woodland path is good and easy although it can be a bit muddy in places. When you get a sighting of the waterfall, Fodnastølsfossen, the path forks and hiking signs mark the directions towards both Fodnastøl and Vatnasete. 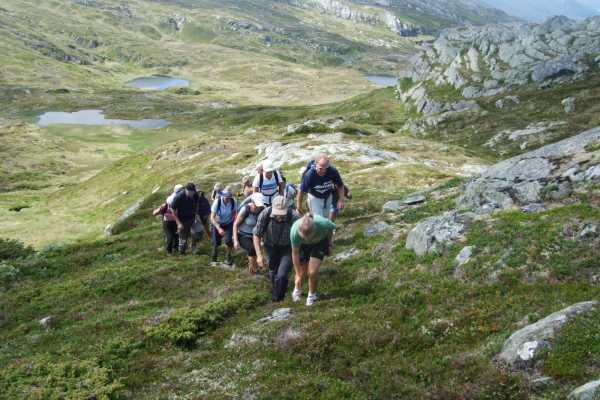 (This tour describes a round trip heading first to Fodnastøl. The character of the hike is quite similar if you should choose to go in the opposite direction.) After choosing to proceed towards Fodnastøl, you will shortly arrive at the watershed from the lake, Fodnastølsvatnet. The waterfall is particularly beautiful during the snow melting in the spring, or after heavy rainfall. The path passes closely to the waterfall and continues towards the lake. On arrival at the lake you can view the cluster of mountain cabins at Fodnastøl on the opposite bank. The marked trail does not include the cabins, but we recommend that you take time for a detour up to them. The hiking markers however, continue on and then down to the lake, Vatnasetevatnet. The path follows along the lake and brings you up to a hiking sign close to the cabins at Vatnasete. The sign marks the routes to Eggjasete/Stuasete (see tour 9) and to Solhaug. 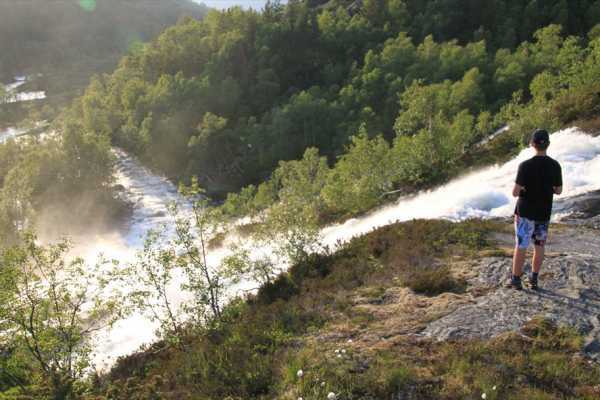 Take the route to Solhaug which loops back to where you first sighted the waterfall, Fodnastølsfossen. Season May – October/November. 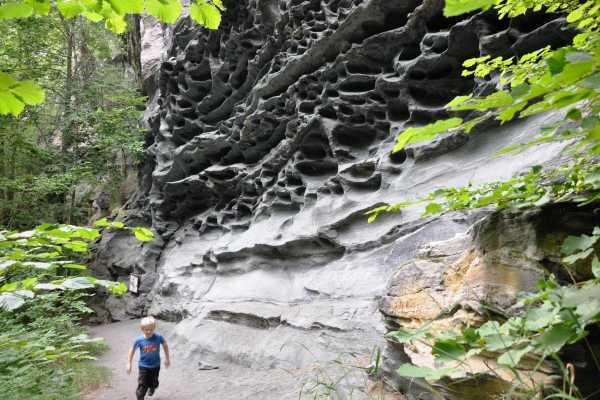 Hiking advice Bring food, drinking water and windproof clothing. We advise you to use hiking boots. If it’s been dry for a while you could use trainers/sneakers. We recommend that you bring a map of the area and a compass, or a GPS. Good cell phone signals covering most of the hike. Dogs must be kept (by law) on a leash at all times between April 1 and August 20. Open fire is prohibited in the hills and woods between April 15 and September 15. You are free to walk anywhere in the hills and mountains. Take care of the nature and show special consideration to all wildlife. Please do not litter. Ask the Tourist Information («Juklafjord») regarding angling/fishing and the purchase of fishing permits. Hiking level Map Starting point/parking Take road 550 2.0 km north east from Herand quay. Turn right, on to a forest road, just before the Samland bridge. If proceeding by car a fee (toll) is asked. The pay point (for cash only) is 20 m in from the main road. Continue 1.8 km up the road and turn left at the sign for Solhaug. Keep on this road another 1.3 km until reaching the end. Car parking is fairly limited and please remember to leave enough space for other visitors to turn their cars around. Parking at own risk. Description of the hike (3 hours, Round trip) Most of the hike is on bare rock, which can become very slippery when wet. It’s easy walking even though the incline is steep. The path crosses a few small marshes nearer to the summit. 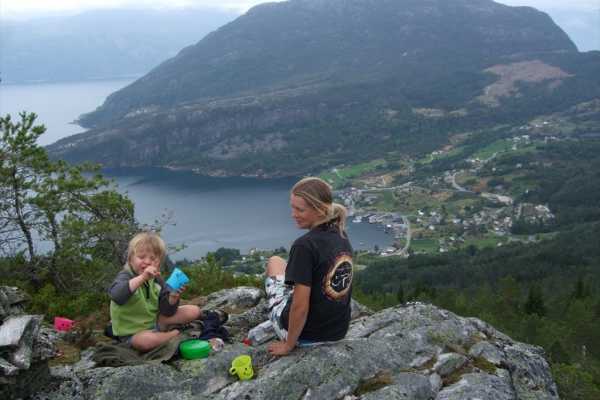 There is a beautiful view of the fjord on the way up and, when you reach the top, there’s a superb view of the village of Herand. Season May - October. DO NOT ATTEMPT this hike if it’s wet, snow, ice or frost. Hiking advice Bring food, drinking water and windproof clothing. We advise you to use hiking boots or lighter walking shoes. We recommend that you bring a map of the area and a compass, or a GPS. Good cell phone signals covering most of the hike. Dogs must be kept (by law) on a leash at all times between April 1 and August 20. Open fire is prohibited in the hills and woods between April 15 and September 15. You are free to walk anywhere in the hills and mountains. Take care of the nature and show special consideration to all wildlife. Please do not litter. Hiking level Map Starting point/Parking The hike starts close to the side of road 550, 3.0 km south of Herand and 2.2 km north of Svåsand. You can find the hike marker 100 m north of the lay-by and picnic spot at Hereiane. Information regarding the hike is on the information board at the lay-by. There is a parking space for 2-3 cars off the side of the road at the starting point. Parking at own risk. Description of the hike (2-3 Hours, One-way) Follow the road past the farmbuildings and onto a farm track. Please remember to re-close any gates you might have opened. After passing the houses at Dalen there is a hiking sign showing the route. The path rises in varied degrees until reaching the mountain cabins at Klepp. From here on the route continues comfortably through the woodlands (some parts are muddy) until you reach the gravel road which ends up at the information board by the lake at Vassenden. Vassenden is a connecting point for tours 9,10 and 11. Season May – October/November. Hiking advice Bring food, drinking water and windproof clothing. Waterproof walking shoes or hiking boots are recomended. We recommend that you bring a map of the area and a compass, or a GPS. Cell phone signals are NOT GOOD during the whole of this hike. Dogs must be kept (by law) on a leash at all times between April 1 and August 20. Open fire is prohibited in the hills and woods between April 15 and September 15. You are free to walk anywhere in the hills and mountains. Take care of the nature and show special consideration to all wildlife. Please do not litter. 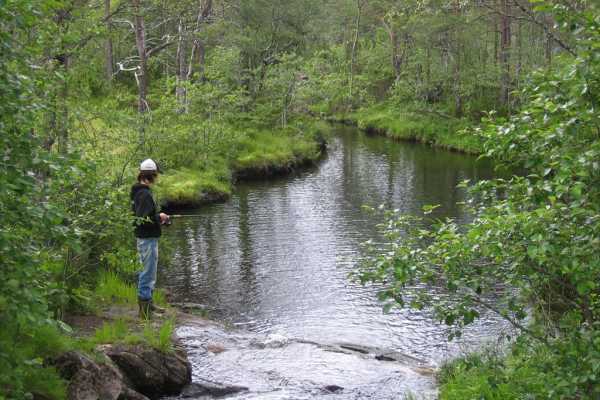 Ask the Tourist Information («Juklafjord») regarding angling/fishing and the purchase of fishing permits. Hiking level Map Starting point/parking Turn off from road 550 (on a farm road) at Svåsand, looking for the information board and the sign marking the tour to Vassenden. Continue up to the farmhouse. Car parking facilities are not good – either park off the main road or up at the farm, in which case be sure to ask the owners permission. Parking at own risk.